The appearance of extraordinary motion of this crystal cluster is both amazing and endearing - it reminds us of a large butterfly - a most strong and energizing one. Depending upon your choice of display position, it's overall 8" x6-3/4" x8" and reads much larger. The largest tabular crystal is 1"x 2-3/4" x4". 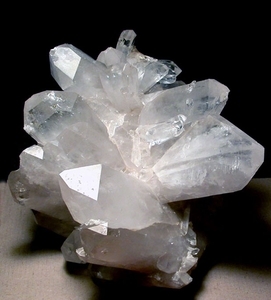 Singles, twins, triplets, doubly-terminated crystals, the same as barnacle and penetrator crystals, a diamond window crystal, a rainbow 'fringe' of crystals leading to a crystal cavern and a 1-1/4" x1/4" [!!] 'winding bridge' of crystals...So many rainbows and record keepers. By the regrowth to its' milky base, this can be said to be a floater cluster, and complete all around. Natural damage, including a conchoidal rainbow area to one crystal of 1" x 2" and several small contacts are noticed in the price, but do not detract. Preferential slight frosting on some crystals, flume-like veils to some, A+ grade for clarity and quality to others - simply a showpiece! Sent doubly boxed with hand written description on our enclosure card. Shipping will be added.